Carson “Kit Carson” Walsky was born in Czechoslovakia on November 14, 1910. His family later moved to the United States, and the coal mining town of Hazleton, Pennsylvania, where he graduated from Hazleton High School in 1930. From 1935 to 1937, Walsky attended Mount St. Mary’s College (now University) at Emmitsburg, Maryland, where he played end on the football team and pitched for the baseball nine. In 1939, despite being 28 years old, Walsky signed with his hometown Hazleton Mountaineers, an independent entry in the newly-formed Class C Interstate League. The Mountaineers, who played at Cranberry Ballpark, were managed by former big league infielder Harvey “Hob” Hiller (he was replaced by the team’s first baseman, Frank DeManicor in June) and included former Red Sox pitcher George Hockette, and future Athletics pitcher/outfielder Woody Wheaton (who would lead the Interstate League with a .428 batting average in 1939). Walsky played 14 games over the 102-game season between May 11 and June 28 - 12 of those as a pitcher (and two in the outfield) - hurling 74 innings (including five complete games) for a 4-6 won-loss record and a 7.54 ERA. He hit a respectable .297 with 11 hits in 37 at-bats and two homeruns, but was released in April 1940, by newly appointed manager Cy Perkins. In May 1942, Walsky, who was married to Cecelia (nee Guzock), entered military service with the Army. He was stationed at Fort Meade, Maryland, with the 76th Cavalry Reconnaissance Troop (Mechanized) of the 76th Infantry Division, and sailed for England in December 1944. In January 1945, the troop arrived in France and were soon in the heat of combat. On February 24, 1945, attached to the 304th Infantry Regiment, the troop crossed the Sauer River at Echternach, Luxembourg, and moved towards Ferschweiler, Germany. Staff Sergeant Carson Walsky was killed in action on February 26, 1945. He is buried at the Luxembourg American Cemetery and Memorial in Hamm, Luxembourg. His widow, Cecelia Walsky, passed away in September 2005. 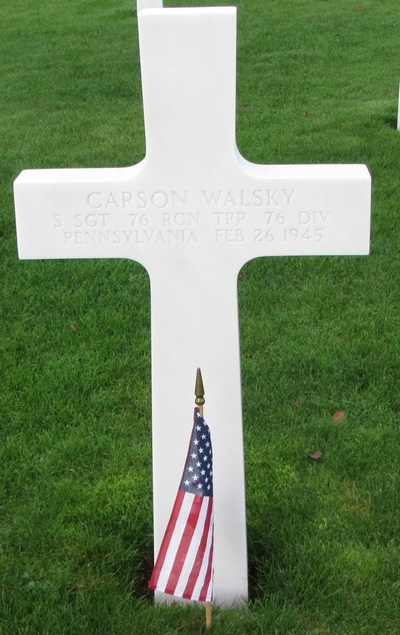 Carson Walsky's grave marker at the Luxembourg American Cemetery and Memorial in Hamm, Luxembourg.